Hello lovely folks! I realise that I’m in danger of starting every post with an apology for not posting sooner, and unfortunately today is no exception. What can I say, job-hunting and moving to a new city has wreaked havoc with my blogging schedule, and it hasn’t be great for my knitting mojo either. I don’t have heaps to share with you, but rather than leaving it another week, I thought I would write a short post to get you up to speed with what’s on and off my needles, as well as a few snippets of general chatter. Those of you who follow me on Instagram will know that I moved to the lovely Edinburgh a couple of weeks ago and it’s definitely been the refreshing change I was in need of. I’m living with a couple of great friends who I’ve known for years, I’ve managed to pick up a part-time Christmas job, and a new city always brings different yarn shops to explore, so all in all, I’m happier. I finished my Christmas socks, guys! I really wish they weren’t a gift because I am so happy with how jolly and festive they look! I’ve talked about this on the blog in the past but I often struggle with severe cases of SSS (Second Sock Syndrome) however, I think I may have cracked the problem with this pair. I started at the cuff and knitted a long tube before working the toe. Then following the excellent photo tutorial by Louise Tilbrook (you can find it here) I cut my knitting and added in a true afterthought heel. I think this technique worked well for me because it felt like there was less stopping and starting. I could just zoom round and round on my stripy tube without having to pause to put in the heel. It’s only a small change to my sock-knitting process but I’m really hoping it’s going to help me to work through my considerable stash of sock yarn in 2018. The only concern I have is that perhaps the reason I got these socks done so quickly was because of the self-striping yarn, because we all know how addictive knitting with that stuff is! Fingers crossed I can keep up my sock knitting momentum even with speckled or textured socks! Ta-dah, my first cabled hat design! I’ve been working on this beanie on and off for the last month and I was thrilled to have a finished written up pattern to send off to my test knitting team (AKA my kind and patient knitting friends) a couple of days ago. My plan is to release it at the end of January as my EVER first paid-for pattern and I couldn’t be more excited about it! The pattern will come in two sizes and uses just one skein of DK weight yarn (though for the larger size you may have to omit the pompom) so it’s a great stash-buster. I love combing interesting textures so I used broken ribbing and a simple 7-stitch cable to create a cosy, squishy fabric. I’ve been wearing mine non-stop and it’s been perfect at keeping out the chilly Edinburgh wind. I have another delightfully wooly DK skein of Northern yarn, this time in Yealand Manor Mule and I’m seriously tempted to cast on a second one this weekend. You can never have too many hats, right?! Despite knitting a large pair of men’s socks, I still had a fair amount of Candy Cane yarn leftover and rather than having it lurking in my stash until next Christmas comes around, I thought I would use it up by making a super simple pair of mitts. Unfortunately, after feeling so triumphant about overcoming my SSS, I think my affliction may have mutated into SMS (Second Mitt Syndrome)! The first mitt absolutely flew off the needles, but the second has been floundering at the cuff stage for at least a week. I’m hoping to finish it off over the weekend and get them posted out to the recipient ASAP. Hopefully this project will be firmly in the “What’s Off My Needles…” segment when I next post. So I feel a little silly even talking about this project because, as the lack of any progress pictures suggest, it has barely made it passed the swatching stage. I currently have a 3 row long halo hanging sadly off one my needles so it really isn’t much to write home about just yet. I picked up one skein of this yarn at the Kendal Wool Gathering a couple of months ago from a new-to-me indie dye company called River Knits. I absolutely love this colourway, it’s so vibrant and has so many layers of colour, the more you look at it, the more colours you spot! Anyway, after swatching with my one skein I realised I really need to get my hands on a sweater’s quantity (you know, as one does) and I’ve written up a rough pattern for a simple, textured stripe raglan sweater which I would love to release as a paid-for pattern some time next spring. Watch this space! So I think that pretty much covers my knitting escapades for the last month, I’m really hoping to have a bit more to share with you when I next post! In the mean time, I hope you have a lovely knitty weekend! 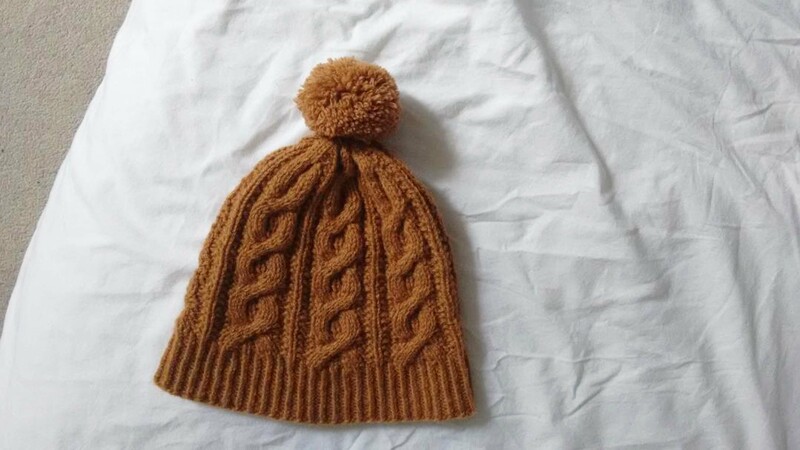 So much happy knitting in this post! You know how excited I am about the hat, and your sweater swatch is SO tantalizing!